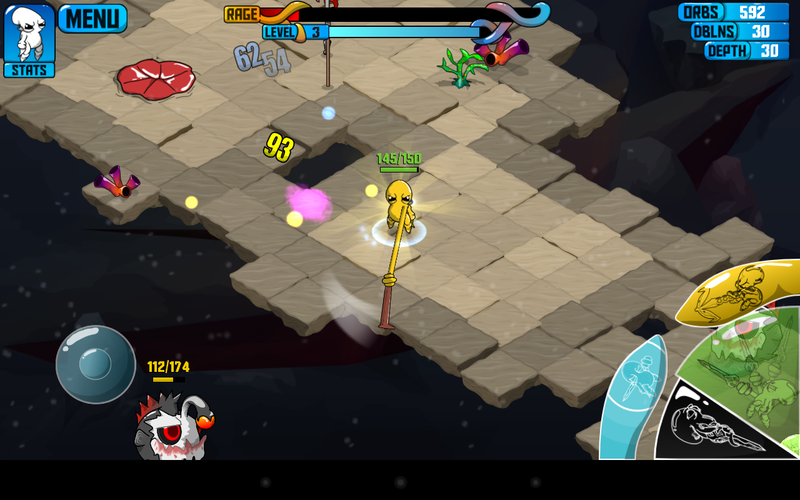 There is not so much a goal in Quadropus Rampage as there is a drive to make it just a little farther each time. 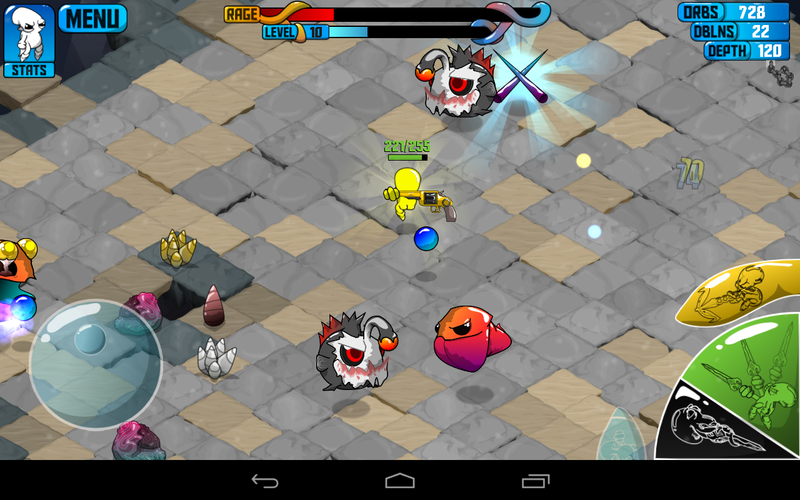 It's the same concept as Punch Quest, but the fighting takes place underwater... and you’re a quadropus. You begin at a depth of ten meters and must vanquish all the enemies with the help of your pet starfish to advance another 10 meters. The game keeps going, deeper and deeper, procedurally generating new levels as you advance to keep things fresh. This is the only way to do such a game. Playing the same opening levels each time would be a deal killer. Your tiny cephalopod (or whatever) has a life bar, but taking out enemies will release some glowing orbs that are automatically absorbed for more hit points. Destroying the fragile undersea ecosystem of coral and plants can also give you a little pick-me-up. If you fall through a hole or off the edge, it's not game over. You will actually land on the next level down, but you take a fair bit of damage. The outcome is the same as if you defeated all the enemies above, but you’re starting the stage at a disadvantage. I like this gameplay mechanic a lot. It lets you bail on a nasty situation, and doesn't punish you too badly if you simply make a mistake. This title has a wacky sense of humor, which is perfectly illustrated by the bizarre assortment of weapons you will find. You start out with a tennis racket, but the game randomly generates new melee weapons based a number of templates. Swords, hammers, giant chopsticks, guitars, and my personal favorite the Inspirational Slothstick Or Whatever. It is exactly what it sounds like – a stick with a glowing sloth on the end of it like a club. The deeper you go, the more powerful and outlandish the weapons become. 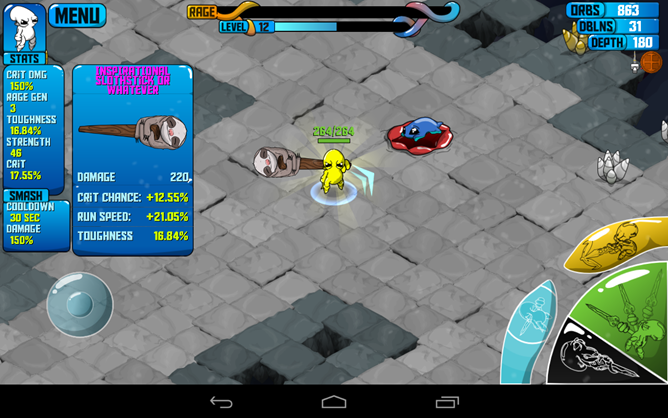 This turns out to be one of the more amusing elements of Quadropus Rampage. The last big piece to Quadropus Rampage’s gameplay – and the part that I think makes it compelling – is the upgrade and mastery systems. As that plucky little sea thing completes achievements you unlock new Mastery abilities to help you along. 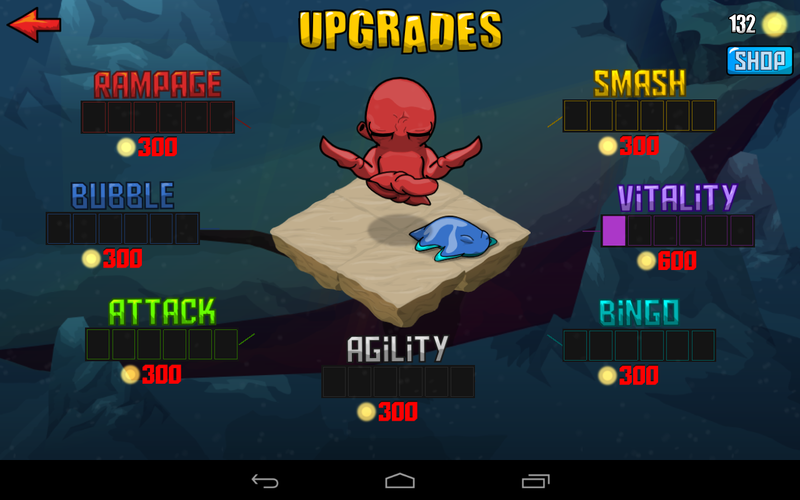 The orbs you collect can also be spent to upgrade the quadropus’ stats. Quadropus Rampage uses the tried and true left-side analog stick to guide your character around the platform. 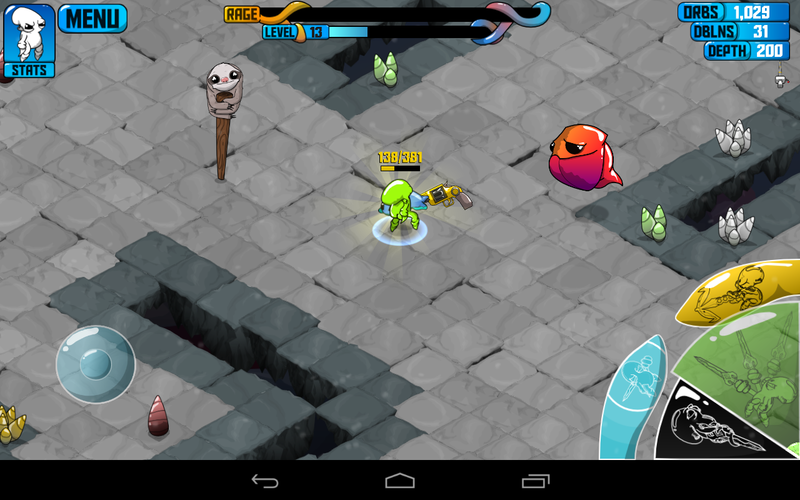 Opposite that you have a cluster of wedge and tentacle-shaped buttons for all your attacks and abilities. You’ll be pounding on the big green one a lot to lash out at enemies, but you can also long-press to charge a 360-degree swing. The black ink wedge turns you into a sticky little projectile so you can quickly cover distance and fly over gaps. The other two buttons are a bit different. 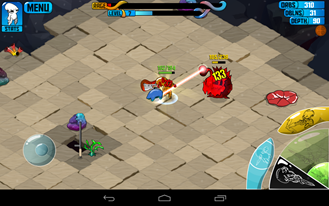 The blue tentacle activates a bubble shield for a few seconds. The yellow one triggers a slam attack. 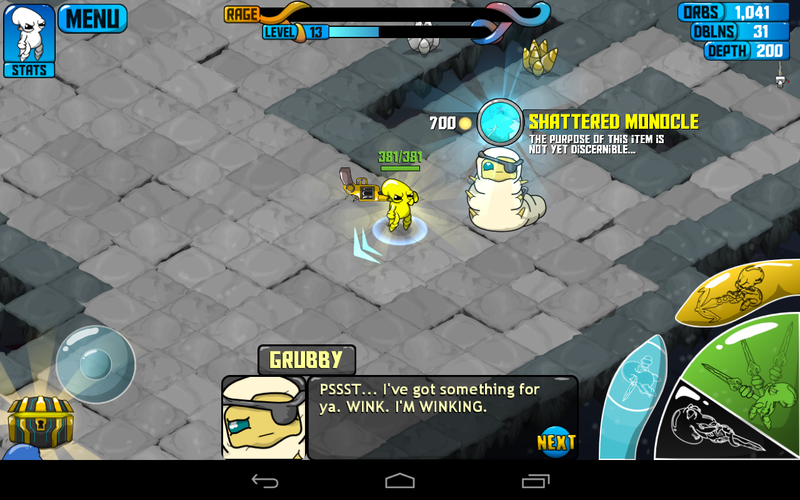 What I like about these buttons is that while the abilities are recharging, they actually retract off screen. This is a handy visual queue letting you know when they’re ready again. Your attention will be diverted elsewhere, so this is a good thing – trust me. The only thing I’m not sure about is the way the thumbstick controls. I feel like I don’t have fine enough control over which direction I’m pointing. This leads to missed attacks at times, though the bad sea creatures have pretty large hitboxes. I suspect this could be tweaked in an update, but it’s not horrible to use as is. I’ll keep this short and sweet. 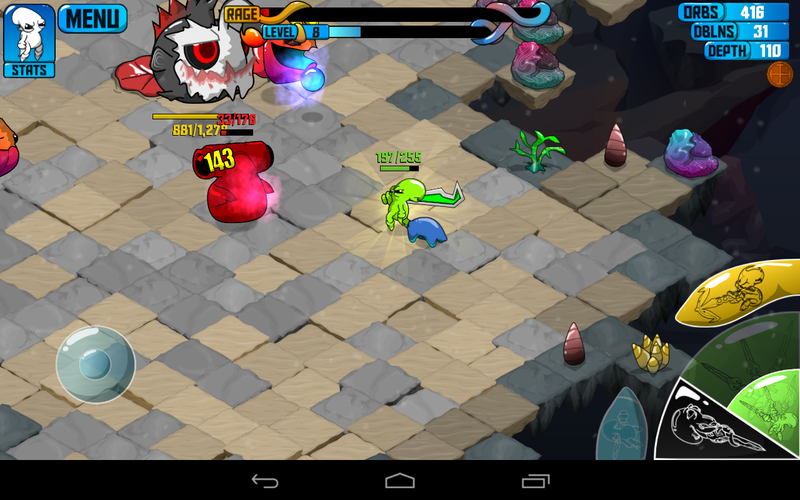 Quadropus Rampage doesn’t do anything new with its visual style. It’s cell shaded with bold edges and very bright colors. I mean, this game is neon-bright at times. There are also some simple lighting effects that actually look quite nice in the context of the style. 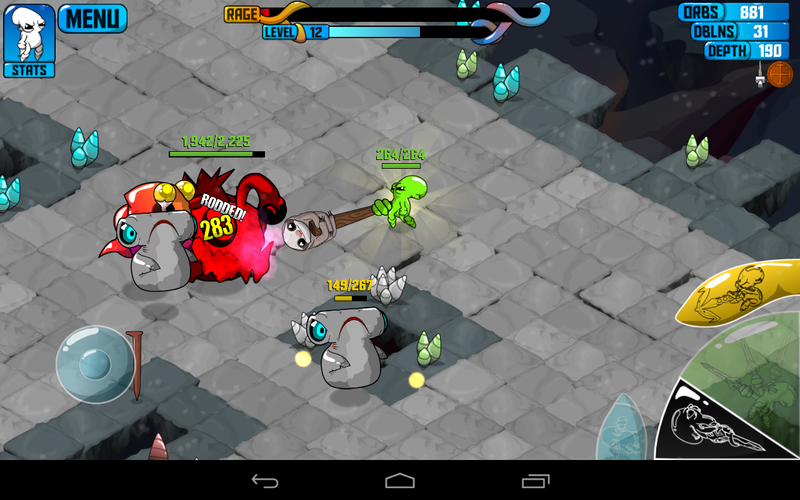 The visuals are very clean, which is important for a game that can often turn into a dogpile on the quadropus. You’ve got to be able to keep track of exactly where you are. 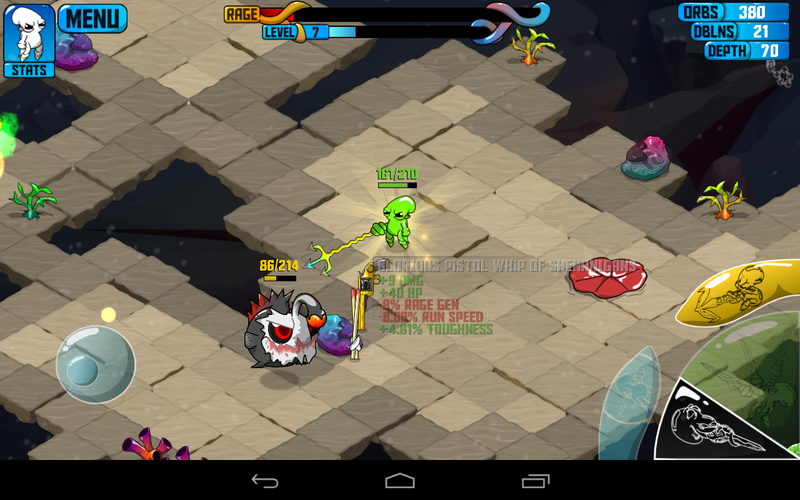 Performance on the Nexus 7 is good, but not great. 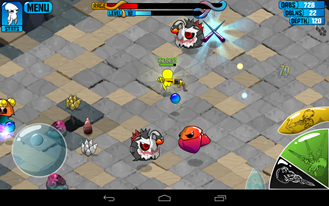 There were occasional slowdowns when loading levels, but the action was fluid. 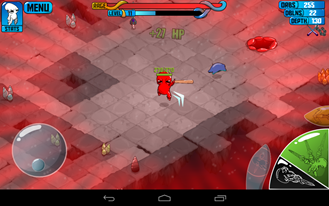 I had a pre-release APK for review, so it’s possible some performance bugs will get squashed shortly after release. The developer, Butterscotch Shenanigans has publically stated that the rates of piracy on its first paid game were extremely high (seriously, stop doing that). As a result, this title is free with in-app purchases. The devs swear everything was developed before IAPs were added at the end. Thus, it should be balanced such that buying things is not required to advance. The version of Quadropus Rampage that I had was not connected to Google Play, so I couldn’t even make any purchases. I still managed to play the game and like the experience. Everything can be unlocked just by playing. Quadropus Rampage is a simple game by any measure. You run, you attack, you attack some more, and so on. However, there are enough unexpected and fun things going on that you stay interested. This is a great title to play for a couple minutes at a time, so definitely download and have a look.